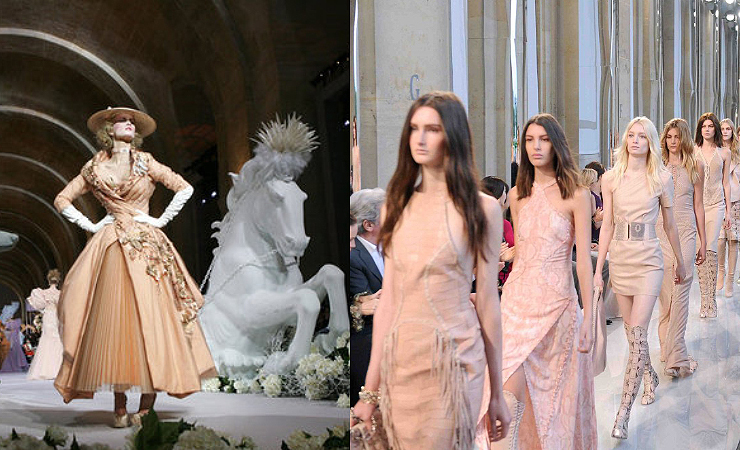 It would be strange if two so ineffably beautiful things as fashion and art existed independently of each other. 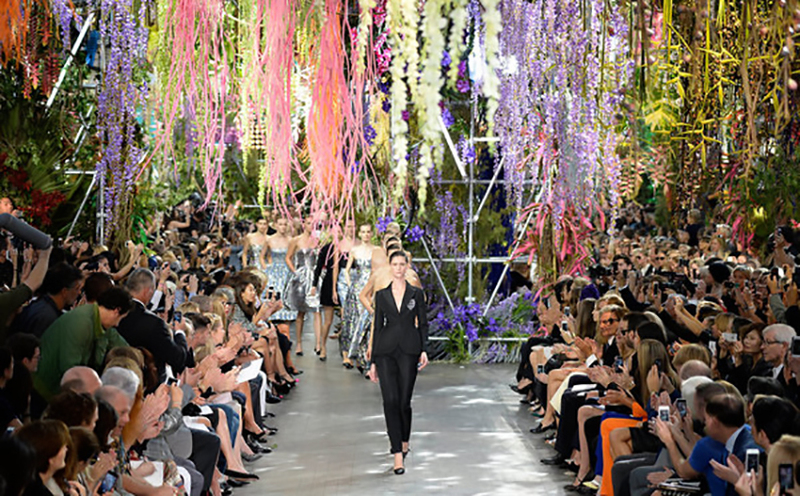 Picturesque canvases, graceful sculptures, inimitable exquisite mosaics and bas-reliefs can be more often seen not only in museums and albums with reproductions, but also on the catwalks. We believe every person who has even a minimal artistic taste has experienced this strange feeling at least once in a lifetime: when visiting Louvre, D’Orsay, Prado, Hermitage, or Metropolitan Museum, each of you would definitely wish to take at least one of those impressive pictures with you. And having that in mind, museums often speculate on these high feelings of art lovers, releasing for purchases the scarves, bags, and even dresses with the prints of Renoir and Monet.. but the true connoisseurs would rather have a negative reaction to such experiments. 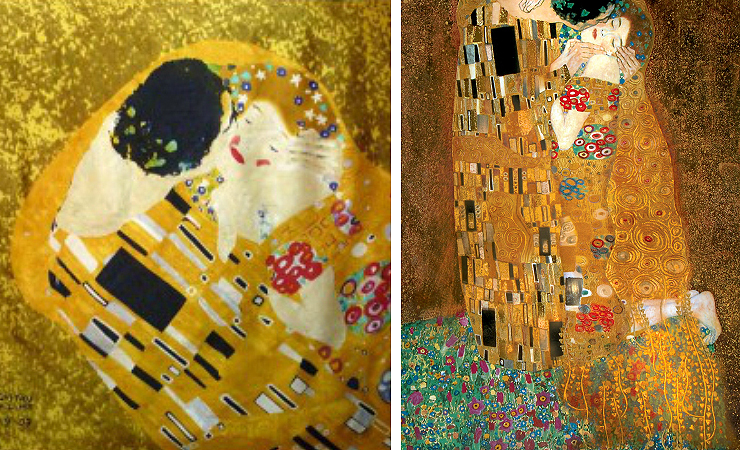 It’s terrible to even imagine what Klimt would say if he would have seen his “Kiss” on a synthetic Chinese scarf for 2 euros! And on the contrary, when the professional designers take on the fashionable interpretations of art – the works of painting, sculpture and architecture become powerful sources of inspiration for creating extraordinary collections in which the masterpieces themselves acquire a new life. Such a cycle! Fine art is an inexhaustible storehouse of plots, ornaments, color combinations and textures. But it’s not enough just to copy the print you like on the dress, you need to feel the piece of art, as well as feel the mood of the artist, understand what the author wanted to say, and express it in the materials, shapes and silhouettes used. Undoubtedly, this becomes possible not to all the designers but genuinely talented works gain eternal fame and enter the history of not only fashion, but also art. Such creative experiments require a certain courage, that’s why either eminent self-assured designers or young and desperate ones manage to do it. For the latter ones, experiments can be a great way to become famous and earn the name. In this sense, the example of the sisters Kate and Laura Mallivi, the founders of the brand Rodarte, can be really illustrative. In 2011, they created a collection that looked as if the great genius of post-impressionism, Vincent Van Gogh, was sewing dresses himself. Violet, blue, yellow and orange colors, scattered by textured and almost tangible strokes on an ideally light and flowing chiffon in an unusual way, conveying the mood of still life and landscapes of the master. The signature pieces of the collection became two dresses which look like from the good old 50’s: “Sunflowers” and “Starry Night” on them (so that no one would have any questions about the source of the inspiration). 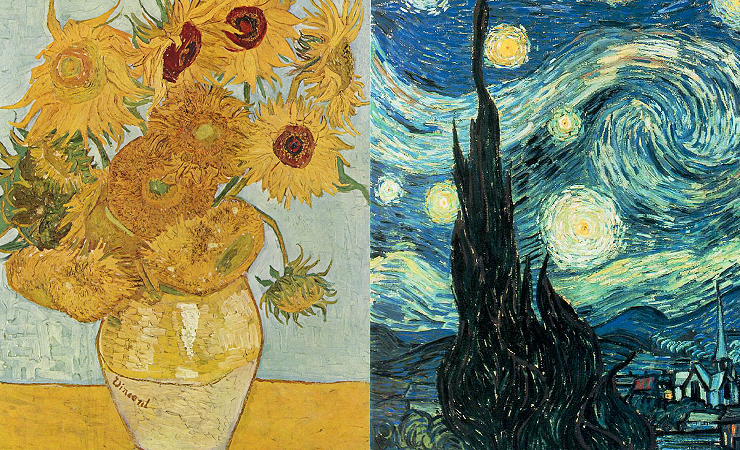 Even the non-fashion magazines then wrote about Van Gogh’s stunning “exhibition” on the New York runway, and nowadays people still speak of them as a textbook example of the interpenetration of fashion and art. 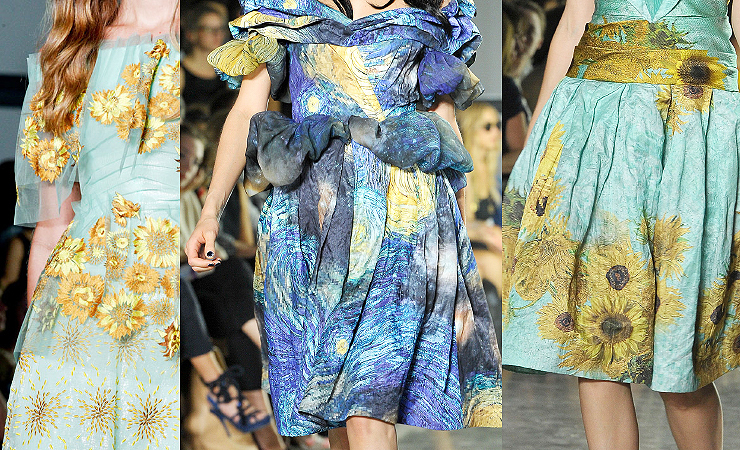 Besides, Rodarte was not the first brand to be inspired by the paintings of Van Gogh. 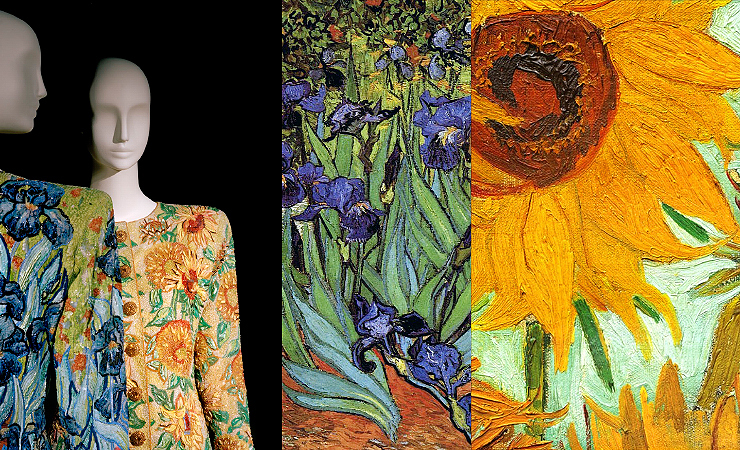 In 1988, Yves Saint Laurent created two brilliant couture jackets, transferring on them “Irises” and “Sunflowers”, slightly increasing the brightness and contrast, as was required by time and the runway. 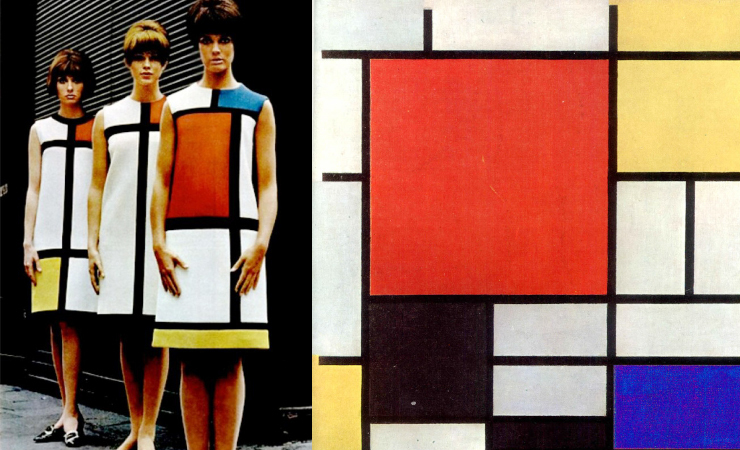 But the main contribution to the alliance of fashion and painting by YSL was made yet in 1965 (on the fourth year of YSL fashion house’s existence), when created the whole collection of dresses based on the abstract paintings by Piet Mondrian. Straight lines, asymmetry of prints, palette, limited only by five colors, – dresses as if sewn from the paintings of the artist! From one side, the collection looked like an organic continuation of the Mondrian series of paintings, and from the other side, was a completely self-sufficient work of art. Another great example of the presence of art in couture collections was a chic white dress by Dior with “The Great Wave off Kanagawa” on it. 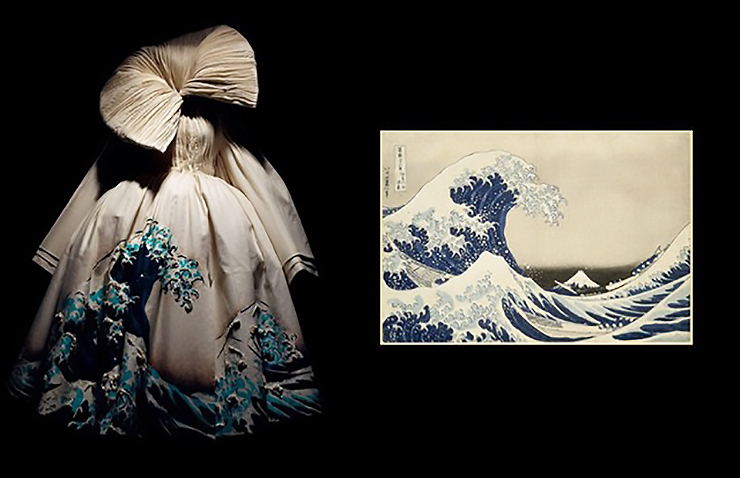 The most famous engraving of the outstanding Japanese artist Katsushika Hokusai, created during the reign of the Tokugawa clan, which made a furor in the spring collection of Dior, thanks to the extraordinary talent of John Galliano. A very special result can be achieved by designers who draw their inspiration not only from the paintings of artists but also carefully study the details of their personal life, track the stages of the creative path. 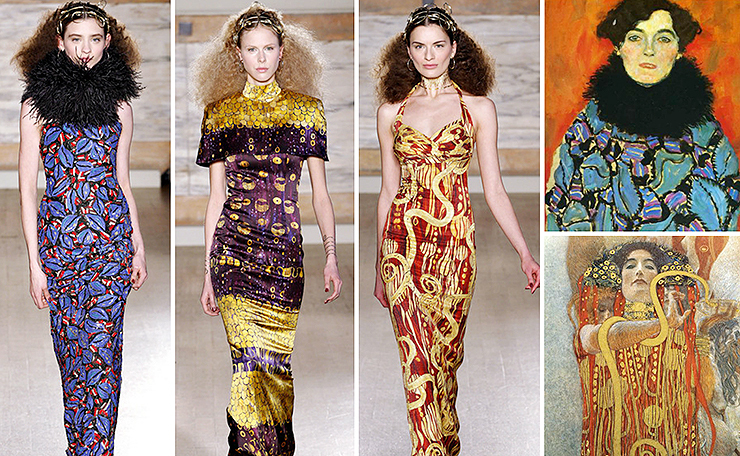 So, an amazing attention to detail and a keen interest in the personality of Gustav Klimt enabled L’Wren Scott to create a collection that amazed not only the external resemblance to the paintings of the first Austrian modernist but also conveyed the mood of his dramatic love story. Tweed, jacquard and brocade dresses, decorated with bizarre Byzantine and Egyptian ornaments, resembled the best canvases of the “golden” period of the master. But the most surprising thing that L’Wren Scott managed to achieve was that he managed to combine in that very collection two completely different worlds between which Klimt lived, loved, and created his masterpieces: the strict aristocratic dignity of Adele Bloch-Bauer and the bohemian ease of Emilie Floege. And in fact, the dresses for sure would have suited the taste of the author’s muse and lover. Modern trends stimulate more and more designers to look for the inspiration in the works of classical and contemporary artists. At the same time, the interaction between fashion and art changes to a completely different quality level, striking imagination and even making the sophisticated audience to admire. 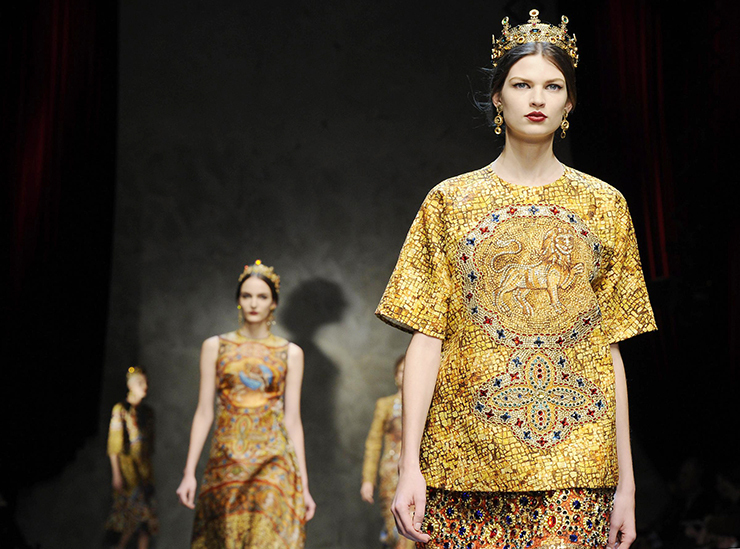 And as a great example of that could be Dolce & Gabbana’s F/W 13-14 collection. In this case, the starting point was not just a painting but a unique example of the sacred architecture – the Cathedral of Monreale in the Sicilian town of Palermo with its ancient church utensils and those items of the luxurious interior decoration. The collection is striking: accuracy in the reproduction of the ttwelve-century mosaics, the naturalness of colors and shades, the organic nature of gold inlaid with multi-colored stones accessories. All these details helped the designers to recreate the incredible optical effect of the golden glow, which was distinguished by the original Byzantine mosaics. With the current pace of the technology and ideas development, one can only guess what will be the forms of interpenetration of art in the future, but thus it is going to be even more interesting, isn’t it? !